After being in Carmel for a few days, I’ve already started gravitating towards a few specific items in my suitcase. With the weather being a bit mercurial here (foggy/cold one moment and super sunny/warm the next), I’ve found layering with light sweaters and anoraks (this one is my fave) to be the best option for an all-day ensemble. 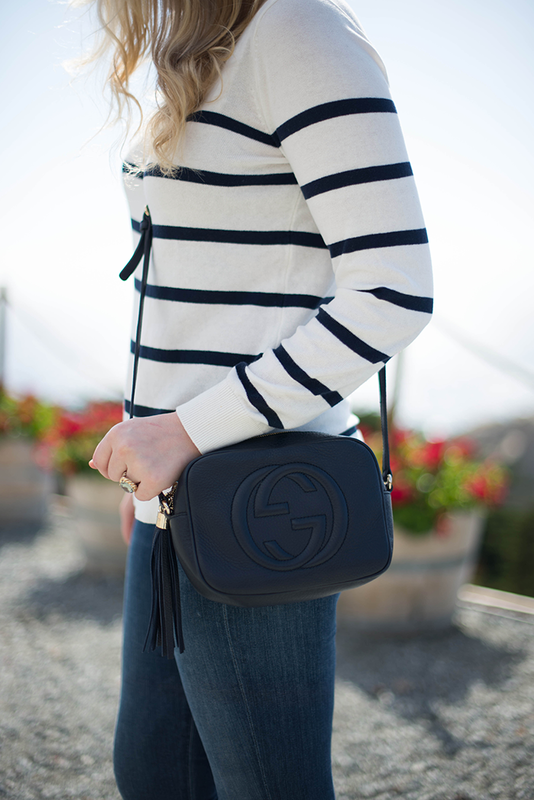 This nautical-striped sweater from Old Navy has been in heavy rotation recently. It’s classic, comfortable and goes with so much! The perfect item and layering piece for this trip, but it is such a good find for Texas too – the weather has been so up-and-down lately, don’t you think? I personally love the navy stripes, but this sweater also comes in a red-striped version if you prefer that color combo. Best part? Both of these sweaters are under $25. Total steal. Not to go off on a tangent, but in addition to the nautical stripes I picked up, I also bought this powder blue and gray sweater ($15), and this thin-striped gray and white tee ($10). Both are super soft and have been wonderful for walks around the city and dressing up at night. Love! Another item I’ve worn every day I’ve been here so far is my new pair of Rag & Bone boots. Isn’t the color fantastic? They’re going to be so versatile and go with everything this spring and summer, but also will transition well with my fall pieces. I guess I should also mention they are the most comfortable pair of heeled booties I own. Reliable, wearable and adorable! 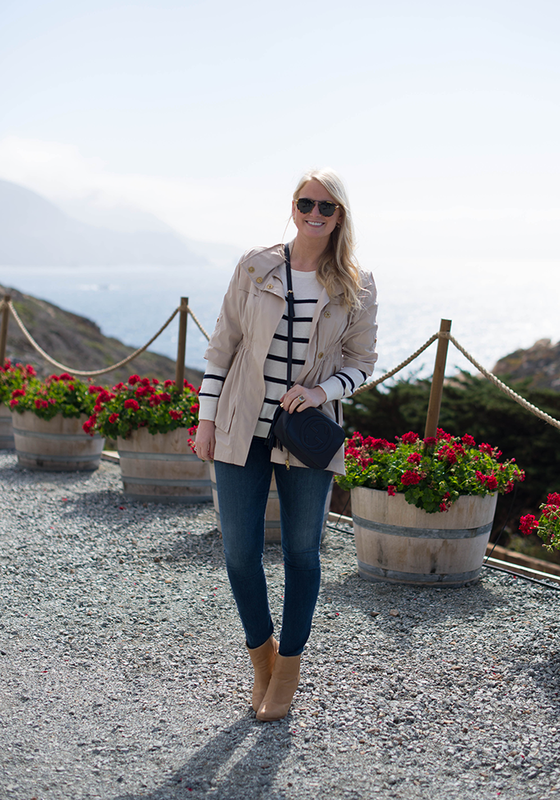 Last but not least, a hands-free crossbody is the best bag for walking around the pretty city of Carmel. You’ll find you don’t really need much while you’re walking around, so a large tote isn’t necessary and a crossbody will keep you from getting those annoying backaches after carrying a heavy shoulder bag all day. What are your favorite travel staples? 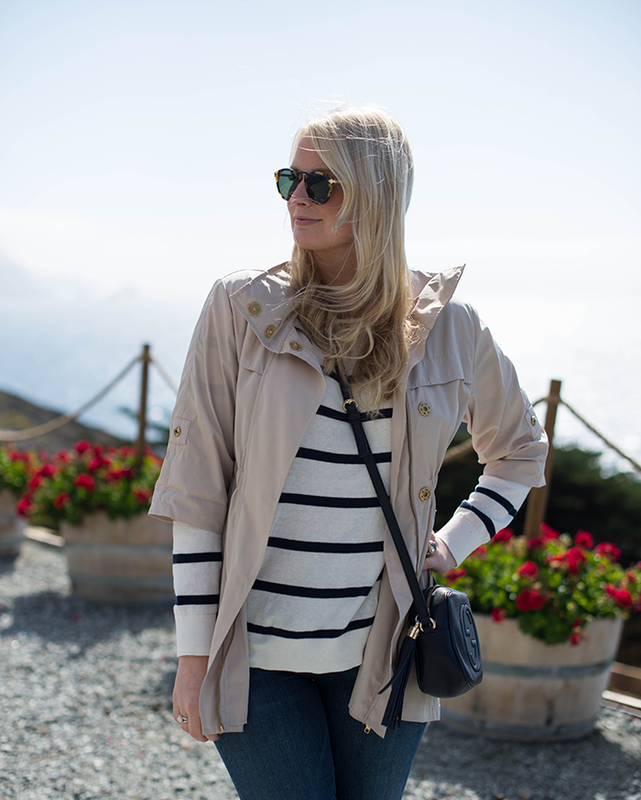 Love a nautical striped top! Love this jacket, it would be perfect for the weather here. Great outfit! 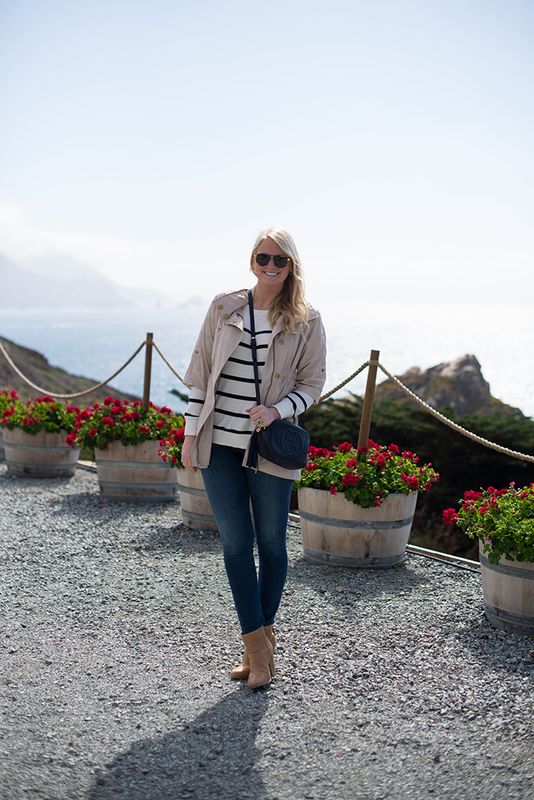 Love this basic casual look, also love that gorgeous backdrop! That old navy sweater is great! 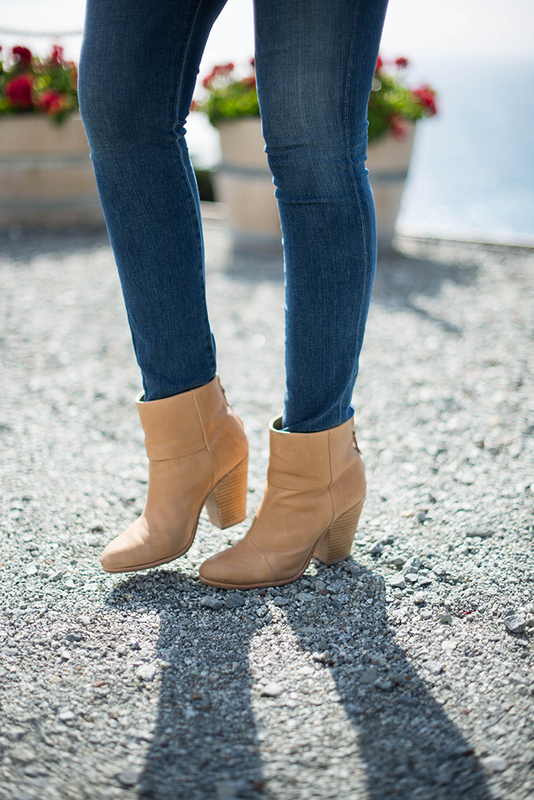 And I totally agree with you that Newbury booties are the best! Such a light and breezy outfit! And can we talk about that beautiful scenery behind you? Gorgeous! Love these simple layers! I’ve always wondered if 3/4 length sleeved coats are practical, but I’ve seen some great ways to style them lately, so I might have a change of heart. Also, those booties are so cute! carmel is so beautiful, glad you’re having fun! Looks like a beautiful place! Hope you’re able to unplug and relax. And I’ve been meaning to say… I’m dying for a closet tour when you get home! Such a great look, especially love the booties! so.. this outfit is pretty much perfect. absolutely love it! especially the long sleeve sweater with the quarter sleeve jacket. ON is doing some good things lately! Just found and loved your blog! hope you can stop by mine! I love that Ali Ro jacket! Love the old navy sweater actually very chic! I love stripes – can’t get enough! How comfortable are those shoes?! Outfit and location both look amazing! that VIEW!!! how beautiful. I wish I were there right now – super jealous! Loving your outfit and especially those boots of course. Such a gorgeous back drop for outfit photos, hope you are having a blast! The color on those boots are fantastic. I love the jacket as well with the striped shirt. I cannot wait for the temperatures to warm up. I love your sweater! 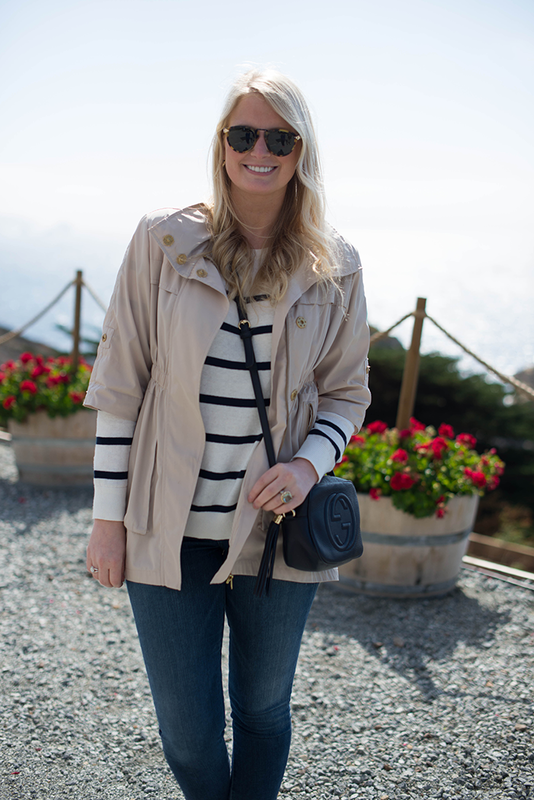 Nautical looking and stripes are some of my favorite words when it comes to personal fashion! Gorgeous pictures. Love the whole outfit – stripes are our absolute favorite! Enter our Edgartown Anchor Bracelet Giveaway! Love this whole look. Simple and chic :) Nice post! wow! The views are stunning! 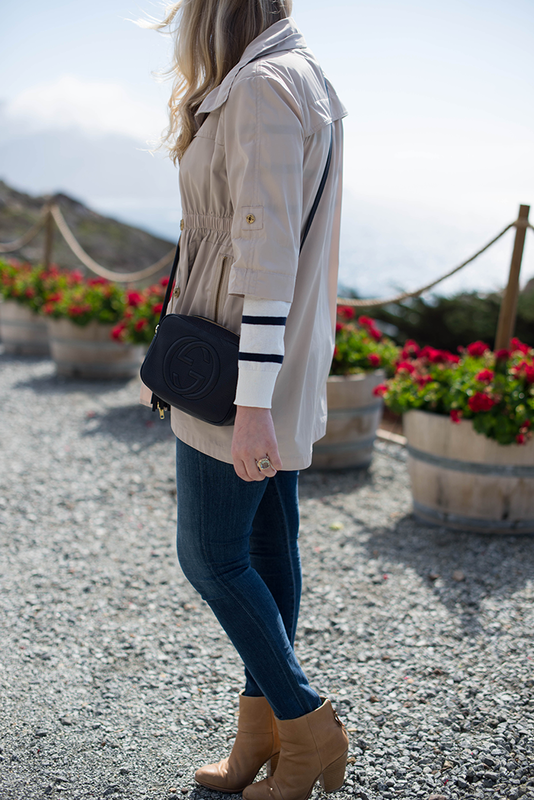 And your outfit seems perfect for the ocassion, love navy style. oh damn I may need those booties, I live in my black ones but need to switch it up! Soooo gorgeous…the scenery, the boots and you! I like these layers. The Old Navy sweater is a great buy. Perfect! Everything about his outfit is just how I love it. Especially those Rag & Bone booties. Rag & Bone is fantastic…I loved reading the feature on the boys behind the brand in Glamour this month. Definitely going to stock up on some of these Old Navy sweaters! So good!! And I want to hear all about where to go in Carmel!! evny ur bag collection :) and u look great as usual ! !